AP D.El.Ed/ D.Ed 2nd Year Exams Time Table, Hall Tickets 2017, Exams in December 2017 AP D.Ed Second Year Exams Time Table, Hall Tickets 2017 for 2015-2017 batch AP D.Ed 2nd Year Exams Time Table - Hall Tickets- 2017: AP DEd 2nd year Hall Tickets, DEd 2nd Year Exams Time Table, AP D.Ed II Year 2017 Annual/Special Exams Schedule, AP D.Ed 2nd year Exams Time Table for Regular and Backlog Batch, AP DEd Second year Public/Special Exams 2017 Time Table, DEd 2nd Year Exams Dates, Hall Tickets of AP DEd 2nd year, BSE AP D.Ed 2nd year exams time table and Hall tickets available at bseap.gov.in. 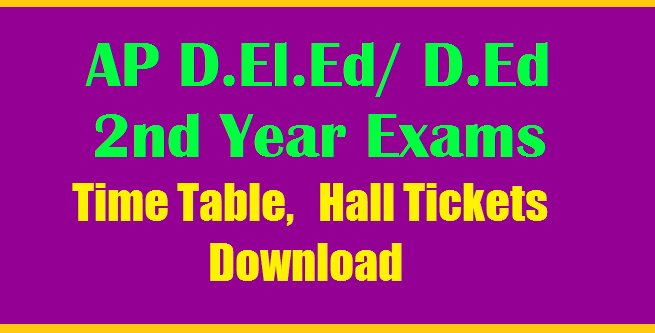 AP D.El.Ed/ D.Ed 2nd Year Exams Time Table, Hall Tickets 2017, Exams in December 2017. Candidates are advised to get D.Ed Second year hall tickets from their DIET Colleges or private elementary teacher training institutes. And also can get the hall tickets from BSE AP web Portal http://bse.ap.gov.in/ This hall ticket is the entry pass of the examination hall, So candidates must keep their hall ticket while you are going to the examination hall. Step 5. Use the below given link for downloading hall ticket..